Zeyno Davutoglu, a gradute of Gazi University Ankara, Political Sciences Dept and MA degree from Marmara University Istanbul European Union Studies, started her banking career at Koc-Amerikan Bank (a Joint venture of American Express Bank with Koc Group of Turkey) in 1991 where she worked at the Financial Institutions Department until 1998. In March 1998 she was appointed to Koratrade Dublin as Marketing Manager. 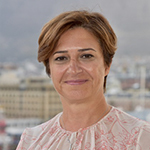 She returned to the Head Office in 2001 as the Group Manager responsible of Marketing of Foreign Subsidiaries of Kocbank A.S. and in 2002 joined to Kocbank Nederland N.V.
Mrs. Davutoglu joined Credit Europe Bank NV in 2005 and a year later was appointed to Malta to open a branch. Since September 2008 she has been working at the Head Office as the E.V.P. Bank Relations.